MatsClock 1046 is not a normal grandfather clock you may have seen before. The pendulum in this grandfather flash clock is hanging in the air without support and looks as if it is suspended some sort of magnetic field. But the clock pendulum is swinging. The only difference in this grandfather pendulum clock is that it is not swinging on a pivot, but I made the pendulum look like a metalic ball that is just rolling from left to right and back. I designed this flash clock without any clock in my mind. I just wanted it to look like a modern grandfather clock with a graphite finish. I was just whiling away time when I saw a magnetic levitation train on the TV and the idea for this grandfather clock frame came up. After that I went about putting the hour needle followed by a minute needle and a few mintues later came the seconds needle. Sometimes the design is simple but takes a long time to decide if it will look good to others. I endavour to keep all my flash clocks as unique as possible. That is also the reason why it takes me a long time to come up with an idea for a clock and then implement it into a clock form. I am sure it must have been really tough for the carpenters working on the intricate carvings we see on those really old grandfather clocks which are now antiques. What is Grandfather Clocks Made Of? Those were made out of solid brass and the best wood available those days. Some of the grandfather clocks I have seen in the museums actually are over 150 years old. It is amazing that people knew about time and they knew it well. Not only that, they also loved to see the time with their own eyes instead of know the time. Probably that is why we see so many old grandfather clocks in almost all the countries world over. How much Time does it take to Make a GrandFather Clock? What baffles me the most is that how on earth did they achieve such beautiful carvings on the wood frame of the clocks. Did they have all the time in the world. Certainly they were not doing the carpentry and brass work for our grand fathers's clocks for free like I am designing my matsclock flash clocks in flash animation software and putting them up for free on this website matsclock.com I can imagine the time they might have spend on their clocks because my software flash clocks takes me over 2 hours for each clock design and some of them are made over three days. Add another day to design a webpage and put it up with the clock embedded in it. You can also get the HTML code to embed all my matsclock free grandfather clocks in your websites and blogs like you see in my website here. 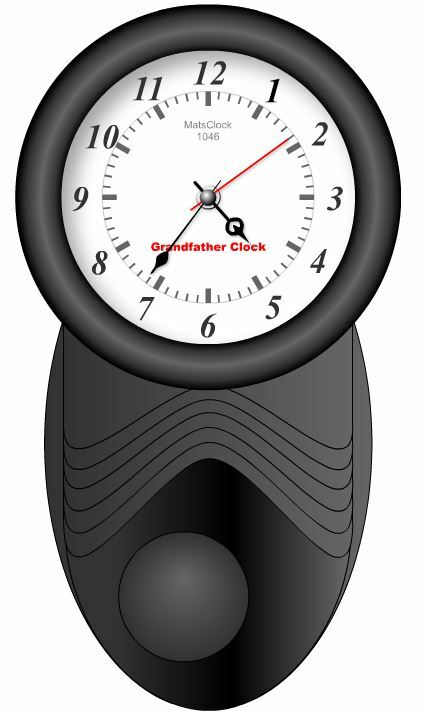 You can also insert matsclocks grandfather clocks into your powerpoint presentations as well. The HTML Code and Insert Powerpoint links teach you how to embed any flash .swf movie file like these grandpa clocks in this webpage into any webpage or into your powerpoint presentation slides to give them a professional look.